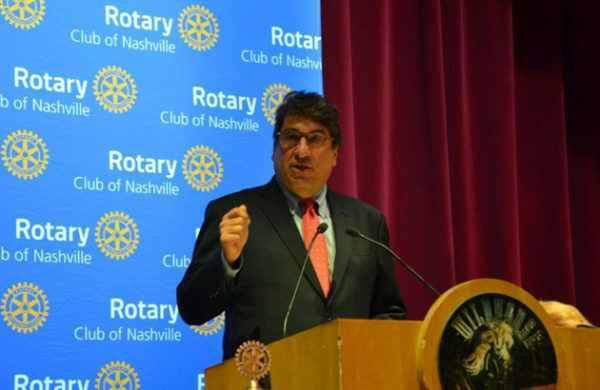 Chancellor Nicholas S. Zeppos addressed the Rotary Club of Nashville on Aug. 27. In a speech to local business and nonprofit leaders, Chancellor Nicholas S. Zeppos emphasized the broad, enduring benefits of higher education—to individuals, society and the city of Nashville itself. He also reminded the audience that top research universities like Vanderbilt are one of the greatest economic development tools a city can have. Zeppos noted that Vanderbilt University and Vanderbilt University Medical Center together generated 63,500 local jobs and more than $3.8 billion in labor income—an impact that has more than doubled over the previous decade. Vanderbilt is also a global leader in discovering new therapies for diseases like Alzheimer’s, Parkinson’s and schizophrenia, he said. Zeppos reaffirmed Vanderbilt’s commitment to offering a “world-class education” to talented students regardless of their ability to pay through the university’s 10-year-old financial aid and scholarship program known as Opportunity Vanderbilt. 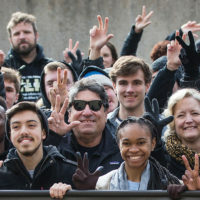 He cited Vanderbilt’s success in dramatically lowering undergraduate student debt while attracting one of the most accomplished, most diverse freshman classes in the history of the university this year.